The Book Arts Mentorship Series introduces the book arts to emerging artists whose primary medium is in another artistic discipline, from writing to pottery, photography to filmmaking, composing to choreography. These artists get intensive education on the traditional crafts of bookmaking — including letterpress printing, hand papermaking, hand bookbinding, alternative printmaking techniques and more — and incorporate these new explorations into their “native” artistic discipline to create new work. This extremely unique cross-discipline artist mentorship program is funded through the Jerome Foundation and facilitated by Minnesota Center for Book Arts. This exhibition is the culmination of a year-long study of new artistic disciplines and one-on-one work with master artist mentors. 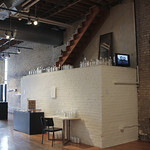 Series III participants were: poet Meryl DePasquale; sculptor and textile artist Caroline Keefe; photographer Ben Lansky; video artist Amanda Lovelee; choreographer, playwright and director Rachel Perlmeter; and photographer and printmaker Keith Taylor. 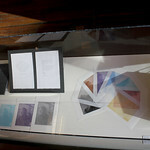 “Dream of a Perfect Interface” is a letterpress chapbook with one long poem structured around skin layers. It has a Japanese stab binding and is printed on fabric paper. My relationship with language has been reenergized because I’ve had the opportunity to study book arts. Words have a tactile quality for me now, as I handle the lead type, ink, and various papers. My poems feel like stretching, snorting creatures, alive inside their physical attributes. As a sculptor I am currently working with industrial wool felt, stone and copper to create pieces that are evocative of landscape or the geography of that landscape. 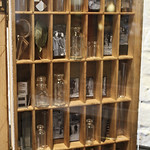 Through these sculptures I explore the cyclical themes of identity and topography, memory and loss. As rivers, wind or glaciers lay down layers of sediment the ones beneath are buried and hidden from view only to be revealed years later by the same natural forces. 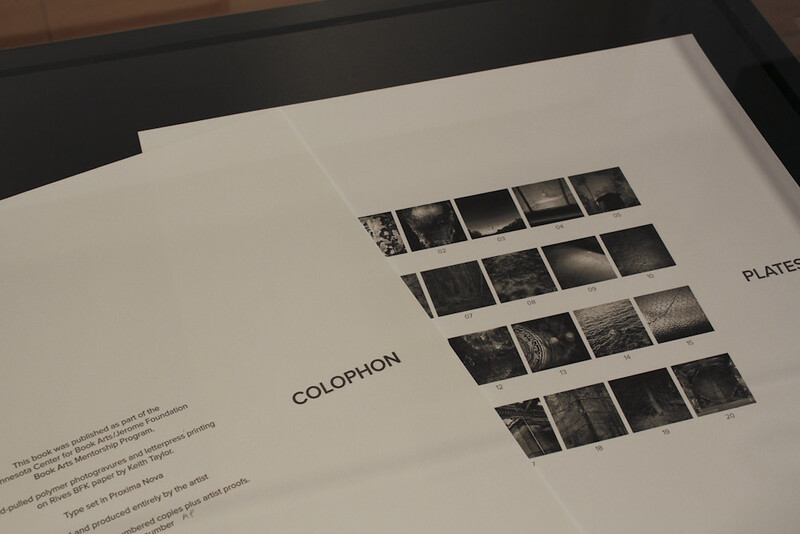 The physical structure of the book form has allowed me to hide and reveal images and text in a similar manner. In addition to being able to print directly to the felt using the Vandercook, I have incorporated traditional sewn binding methods instead of glue to hold the sculptures together. Using portraits photographed on a city bus, I created a multi-faceted project involving handmade and commissioned prints. 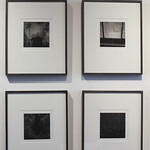 At MCBA I’ve created photographic prints through newly learned processes. Exploration of these mediums has allowed my conceptual art practice to navigate down a new path. 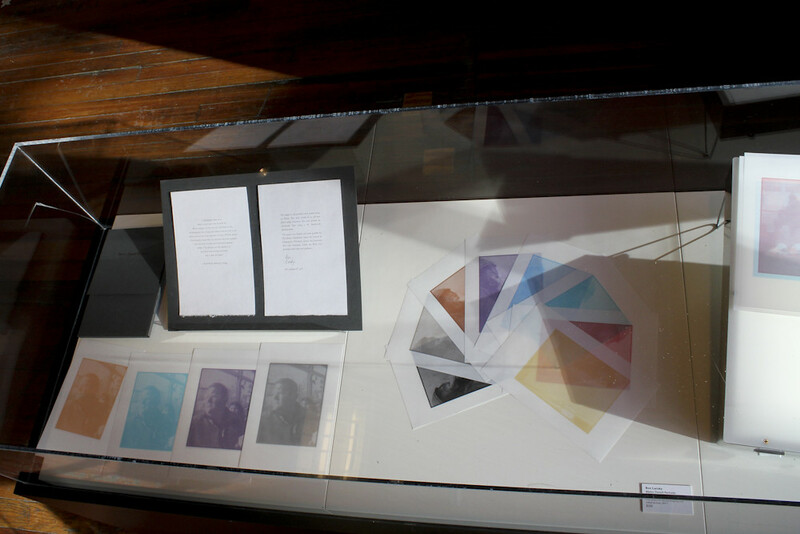 The set of four books on display were created by artist Amanda Lovelee and are part of a larger project she has been working on for over a year. 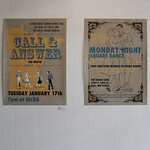 The Call and Answer Project is a project about human connection, strangers holding hands, and the joy of Square Dancing. The project has many components ranging from a documentary movie, participatory square dances, photo booths where if you hold hands with strangers you get such rewards as a piece of pie or free books. 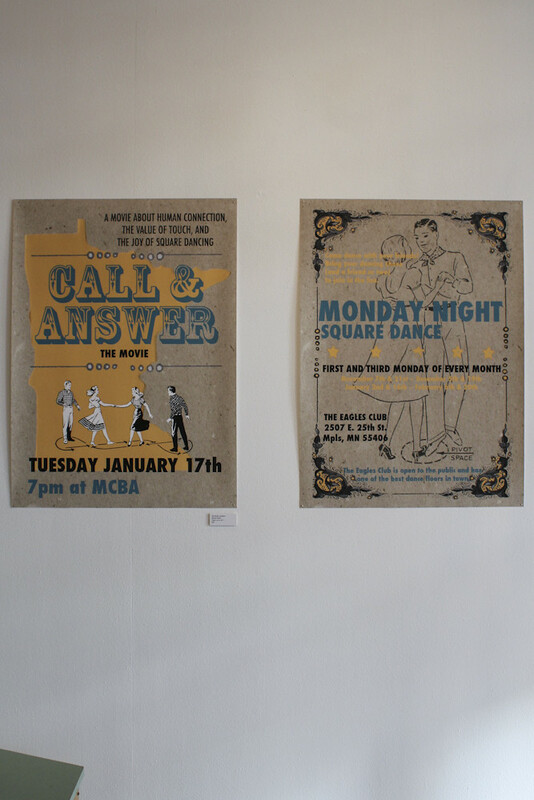 In June, MCBA helped Lovelee host an all night printing party and square dance as part of Northern Spark. On that night 2000 books were printed with the help of many volunteers. At the show opening in November you will get a chance to watch Lovelee’s 17 min. movie and pose for a photograph with a stranger to receive one of the letterpressed books. My project, “Dark Matter”, centers around my search for interesting shadows and shapes in the landscape around the Soudan Underground Laboratory in northern Minnesota, where the CDMS II project is looking for evidence of dark matter. 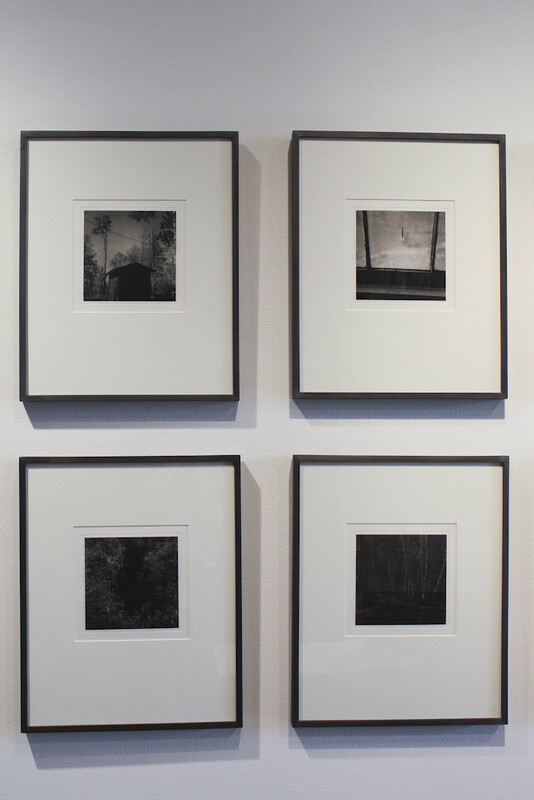 My photographs use the visual phenomenon of shadows to imply the presence of dark matter in a conceptual way, and are printed in photogravure to take full advantage of the inky blackness and slightly embossed surface of the medium. 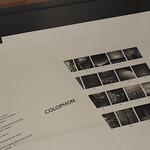 The book, in an edition of ten, consists of a suite of twenty unbound, but sequenced, photogravures printed on Rives BFK with letterpress text pages, and enclosed in a single tray case. 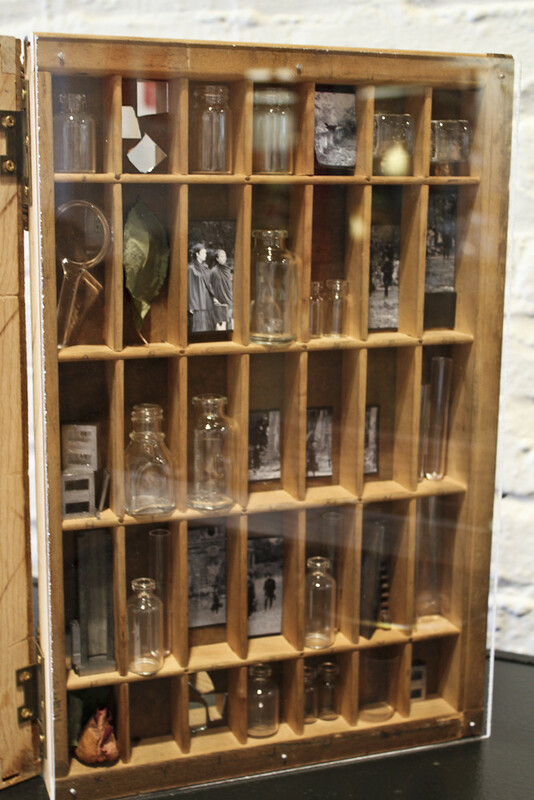 I had always thought of a gallery as being the final showcase for my photography, but the MCBA/Jerome Foundation mentorship has shown me how it’s possible to incorporate the book arts into my work and how it’s a logical alternative to displaying a sequence of images on a wall. Since 1985 the Jerome Foundation has helped artists push the boundaries of contemporary book arts by supporting the creation of new book works. 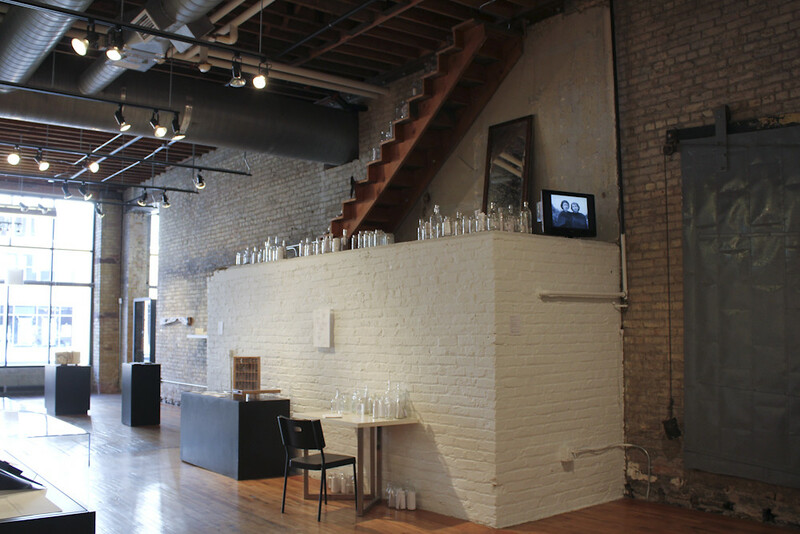 Under the previous ten series of fellowships, Minnesota artists of diverse disciplines — including printers, papermakers, binders, painters, sculptors, poets, photographers, essayists and others — have created projects ranging from exquisitely crafted fine press volumes to documented performances to one-of-a-kind installations that “break the bindings” and redefine conventional notions of book form and content.